"Once you enter, the imagery and power of Blood Line – if for no other reason than the sight of Antigone walking out its doors into the night amid a hailstorm of rocks – wraps itself around you like a boa constrictor and refuses to let go." Teiresias (Katie Taber) overcome during a prophecy to Creon (Mark Ulrich, left) when she sees the dead Oedipus (James Stanley) appear next to him in the throne, echoing Creon's denials with his own from the first act. 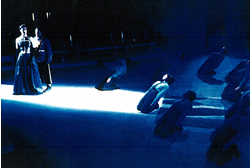 Fed by her continuing interest in classic texts, Artistic Director Joanna Settle began to consider presenting Sophocles' Oedipus the King and Antigone (both written in 5th Century BC) in a single two-act production. She approached scholar/translator Nicholas Rudall with a list of detailed questions about the scripts as written in the original ancient Greek. Antigone (Anne DeAcetis) exits to her death. 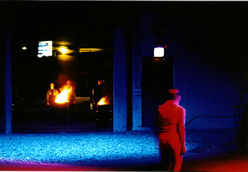 The doors of the theatre were opened to reveal the 10 member chorus singing around barrels of fire as she walked past them into the dark Chicago night. Euridice hears of the death of her son Haimon. The messenger's speech to her was delivered most intimately into a microphone behind her ear, while the chorus bowed away in respect.